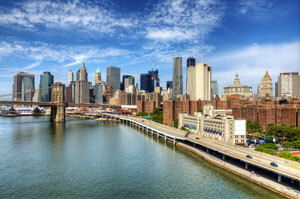 New York City is the financial, artistic, and technological heart of the United States. Along with the prospects for billboards on the Belt Parkway and the Cross Island Parkway, the amount of advertising opportunities in Manhattan, The Bronx, Brooklyn, Queens, and Staten Island is only limited by your imagination. Billboards in Times Square, taxi advertising on the famous New York yellow taxis, even outdoor advertising at one of the world famous sports arenas like Yankee Stadium or Madison Square Garden are at your disposal. You can also target your audience with competitive pricing for advertisements in the New York City Subway or more local advertising around one of the many universities in the city like Columbia University or New York University. Billboards and advertising on a world scale along with competitive advertising rates makes the Big Apple a truly effective advertising opportunity. Zip Codes:10001, 10002, 10003, 10004, 10005, 10006, 10007, 10008, 10009, 10010, 10011, 10012, 10013, 10014, 10015, 10016, 10017, 10018, 10019, 10020, 10021, 10022, 10023, 10024, 10025, 10026, 10027, 10028, 10029, 10030, 10031, 10032, 10033, 10034, 10035, 10036, 10037, 10038, 10039, 10040, 10041, 10043, 10044, 10045, 10046, 10047, 10048, 10055, 10060, 10069, 10072, 10079, 10080, 10081, 10082, 10087, 10090, 10094, 10095, 10096, 10098, 10099, 10101, 10102, 10103, 10104, 10105, 10106, 10107, 10108, 10109, 10110, 10111, 10112, 10113, 10114, 10115, 10116, 10117, 10118, 10119, 10120, 10121, 10122, 10123, 10124, 10125, 10126, 10128, 10129, 10130, 10131, 10132, 10133, 10138, 10149, 10150, 10151, 10152, 10153, 10154, 10155, 10156, 10157, 10158, 10159, 10160, 10161, 10162, 10163, 10164, 10165, 10166, 10167, 10168, 10169, 10170, 10171, 10172, 10173, 10174, 10175, 10176, 10177, 10178, 10179, 10184, 10185, 10196, 10197, 10199, 10203, 10211, 10212, 10213, 10242, 10249, 10256, 10257, 10258, 10259, 10260, 10261, 10265, 10268, 10269, 10270, 10271, 10272, 10273, 10274, 10275, 10276, 10277, 10278, 10279, 10280, 10281, 10282, 10285, 10286, 10292.